Christmas mood is in the air and it is absolutely impossible to miss it. Everyone around is filled up with excitement and joy as well as anticipation of the coming holidays. The streets are decorated with glistening balls and garlands, whereas numerous shops offer a thousand of gifts to opt for. Christmas cards, gift stockings and the tune of old good Jingle Bells create a fantastic atmosphere which makes it impossible to not fall in love with it. Among all of the Christmas attributes, there is one that stands out from the crowd. Christmas tree is the element without which it will be quite hard to hold a decent and memorable celebration. The very tradition of decorating the evergreen (fake or real) tree with tons of ornaments adds a ceremonial touch to the whole holiday. This is exactly what this post is inspired by: below are ten awesome outfits that will remind you of a beautiful and magic Christmas tree. Once you take a look at this mesmerizing evening gown in glistening emerald green, the first and probably only association coming to your mind will be our beloved Christmas tree. It is very hard to take the gaze off this number, as it is full of the elegant vibe and exquisite zest. The low V-shaped neckline is combined with short sleeves, delicate belt and floating silhouette – which all together create a breathtaking impression. If you have something different on your mind, then this outfit might fit into the limits of your imagination. A glimmering high waisted pencil skirt in pine green is combined with a black top featuring a rain-drop neckline and long sleeves. The skimming fit of both pieces is complemented by lovely ankle straps in black suede and a magnificent minaudiere in turquoise and black. Here is another look featuring a skirt; yet, this one is styled in a totally different way. Full skirt it maxi is paired with a crop top in black. The plain design of the outfit is embellished by a range of saucy statement necklaces, vintage sunglasses, and a lovely minaudiere in gold and black. This is the look that I fell in love with the moment I saw it. A skimming mini dress in emerald green is embellished with a million of shining rhinestones that completely repeat the design of a Christmas tree. This number is by all means something that was inspired by the holiday mood. However, I would not recommend you to rock such a frock to the celebration party, as you may end up blending in with the main decoration. Here comes probably the most moderate outfit of today’s collection. A beautiful and very stylish tunic in several shades of green is combined with a pair of black tights, chunky leather booties, black biker’s jacket, emerald green handbag, a cute necklace and a pair of funky glasses. This outfit will speak to those ladies who are not fanatic about classic dresses and tons of embellishment. The next outfit features a very unique and engaging combination of textures and colors. A bright and shining long-sleeved top in dark green is paired with a somewhat tropical mini flare skirt in light blue and neon green. The cool ensemble is completed by a violet clutch and a trendy necklace in silver. Another outfit featuring a skirt will also speak to you a lot. Cream long-sleeved shirt with a beautiful print is combined with flare high waisted skirt in emerald green that is embellished in a quite unique way. A pair of black and white shoes along with the black leather bag and saucy glasses finished the trendy and catchy look. Here is a very saucy way of combining an oversized chunky turtleneck sweater in navy blue with a full maxi skirt in emerald green. The leather texture of the latter gives a very appealing and saucy look, whereas the soft fabric of the sweater makes one want to cuddle in. A pair of ankle strap wedge shoes in black along with an elegant clutch in charcoal gray and sunglasses in leopard-printed frame completed the saucy look. Here is an alternative to your outerwear piece – an emerald green floor-length coat in a sophisticated fit. The rest of the outfit is styled in a very moderate color palette, which makes the coat stand out and attract the most of the attention. A pair of capri pants in black is paired with a matching top, while dark brown loafers and elegant leather handbag finished the trendy outfit. 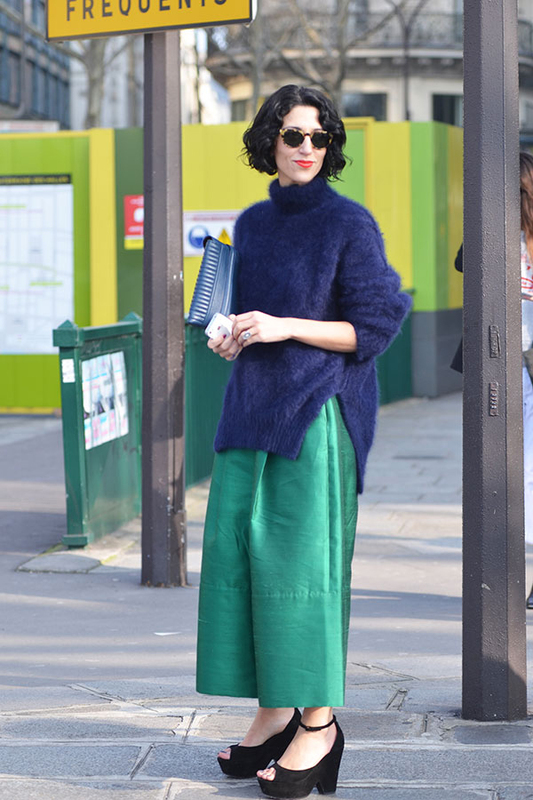 Have you ever thought of rocking a green fur coat instead of a regular one? If you did not give a thought to it yet, here is your chance. Such an outerwear piece will make even the most boring and cliche ensemble look more exquisite and alluring. Especially, when it is combined with a pair of brightly printed pants in white and green, silver sandals and saucy multi-colored clutch complemented the striking ensemble. These were the ten stunning outfits that are inspired by a Christmas tree. Hopefully, they gave you more of the holiday mood to survive the rest of the week.